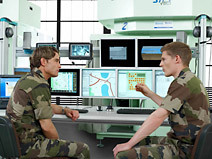 Our virtual training and simulation systems combine real people and real platforms with a virtual environment. They encompass original control units and – depending on your requirements – motion systems, audio systems, and environmental representation using high-resolution visual systems. Our highly available training systems allow effective exercise at reduced cost and without any environmental impact.